Stress management when quitting smoking is a major key to being smoke free for life. Many smokers light up at the first sign of a stressful situation. They use their smoking as a form of stress relief. Although they think that it is helping them to cope with stress what they do not realize is that the nicotine is a mood altering drug, called a psychoactive. It is only masking the effects of the stress, such as feelings of anger, anxiety or frustration making them seem less severe. In reality, even though the smoker feels less stressed and calmer, smoking puts more stress on the body. The smoker's body still reacts to the stressful situation in the following ways. If you have decided to stop smoking or have recently quit, learning to cope with stress is very important for your success. Changing long time habits of smoking, combined with the physical withdrawal from nicotine, is a very stressful situation in itself. Learning stress management techniques such as positive visualization, progressive muscle relaxation and deep breathing exercises will help to alleviate the stress felt when you become smoke free. Take advantage of the smoking cessation programs and stress reduction workshops that are offered. These programs and workshops will give you the tools and techniques needed for successful stress management when quitting smoking. 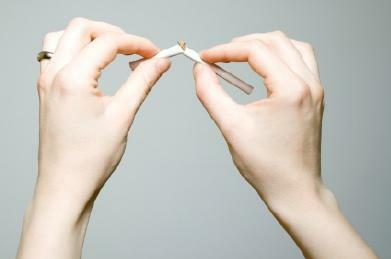 Once you have quit smoking, you may no longer reach for a cigarette when you encounter stress. It is necessary to develop new coping strategies to handle everyday stressors as they develop. An effective stress reliever is physical activity. Many former smokers find they enjoy working out at a gym or taking walks. They not only have an alternate stress reliever, they also benefit from the added physical activity resulting in a healthier body. Finding time to relax is also an important part of stress management when quitting smoking. Make time to practice your relaxation and deep breathing techniques, mediate or read. You will feel the stress of the day melt away. The Tobacco News and Information website offers quit smoking tips, stress management techniques and many additional links to more resources. Why Quit offers a vast array of information on quitting smoking including motivational resources, stress management information, a stop smoking benefits timetable and much more. Way 2 Quit explains how to beat nicotine addiction and includes useful tips to help you quit smoking. Learning new ways to deal with the stress you encounter in your life is an essential aspect of long term success in quitting smoking.